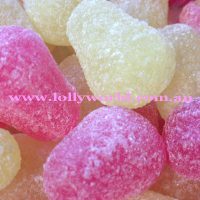 Tilleys Pear Drops online at Lollyworld a World of Lollies. Tilleys Pear Drops a classic English lolly made in Britain. They are a boiled lolly with a pear taste. These ones are small, around the size of an Australian 10c piece. They are not round though, they are in a pear shape and also dusted in a light sugar. Perfect for something other than a minty boiled lolly. There is approx. 50 in a 250g bag and 200 in 1kg.